Vintage from Paul is pleased to offer this classic Blue Ridge Southern Pottery Rustic Plaid Creamer. 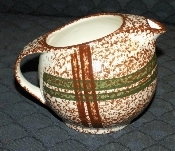 Rustic Plaid has a creamy ivory body decorated with a brown sponge design and wide dark brown and deep green intersecting lines, creating the "plaid"
The Blue Ridge Southern Pottery Rustic Plaid Creamer stands 3-1/2 inches in height and measures 5-1/8 inches from handle to spout. The Blue Ridge Southern Pottery Rustic Plaid Creamer is in Mint condition having no chips, cracks, scratches,crazing, or other defects. The graphics are crisp, the colors vibrant.